This time of year, our homes tend to be filled with friends and family. Some pop over to enjoy a meal from the neighborhood, others travel many miles and spend several days with us. For those that will be staying with you a few days or more, it's important to create inviting spaces for them to enjoy. Since our guest rooms don't get used on a regular basis, they are sometimes the most neglected spaces in our homes - used as a storage room or a place filled with leftover furniture and accessories that didn't seem to fit anywhere else. Now that friends and family are on the way, it's time to spruce up these spaces and get them ready for the company that will soon be staying. 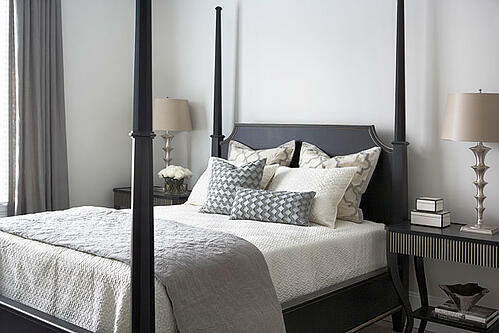 We've rounded up a few cozy guest rooms to get you motivated and inspired to tackle the task at hand. Leave your guests with optional reading material in their room to enjoy when they have downtime or right before bedtime. In this guest room, a book is placed in a prominent place directly on the bed for guests to see when they walk in. A strategically placed book also makes the room feel more cozy and lived-in. Sometimes guests will get hungry or need something to drink but don't like to bother their hosts. Prepare in advance to have some snacks and drinks available in their room to make them feel welcome and taken care of. Leave the snacks on a pretty tray on the bed, like this guest room, so guests will see it right when they walk in. Fresh flowers are another way to make a room feel warm and inviting. Stop by the store on your way home to pick up some tulips or roses and place them in a small vase on one of the nightstands in the guest room. If you have guests that have allergies or don't like the idea of buying fresh, purchase a few of our favorite NDI botanical reproductions for an exquisite alternative. It's important to have luxurious and comfortable bedding not just for your master bedroom but also for your guests to enjoy when they visit. Invest in some comfy pillows and soft bedding and blankets so your guests will leave feeling relaxed and rested. This gorgeous guest room features some our favorite bedding items that are both beautiful and comfortable. You can browse our bedding collection in our online boutique to purchase many of the items you see below. 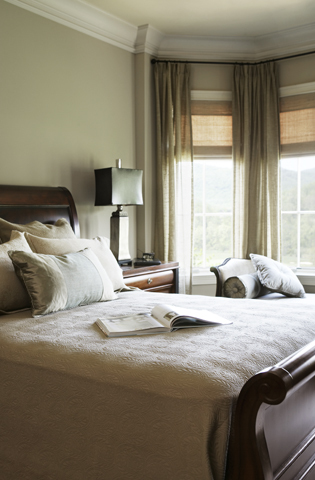 Last but not least, make sure to consider the ambiance and lighting in your guest room. Make sure you have lamps on each nightstand for guests to use for late night reading. If the room lacks any overhead lighting, be sure to have additional lamps available in the room for guests to use if they wish. 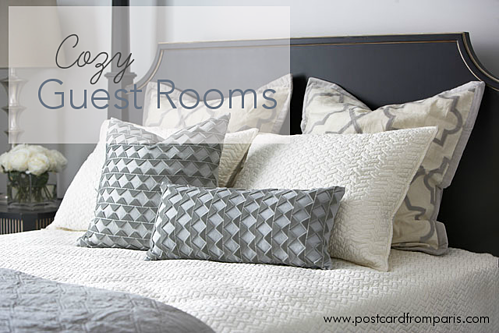 What is the current state of your guest room? Is it ready for the family and friends on their way, or does it need a bit of sprucing up? Looking for last minute gifts? Check out our online boutique by clicking on the button below.